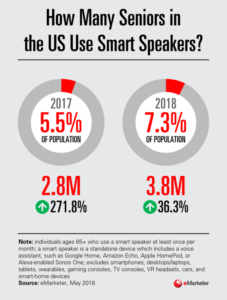 While most might think that Smart Speakers appeal only to Millennials or the young, usage has grown almost 40% among older consumers (Americans 65+) in the past year. Granted that many have received the speaker as a gift from family, but the fact is that the Smart Speaker is a product that could have been designed around the needs of older people – yet few have probably considered this segment in their design or marketing. According to this article in eMarketer, Amazon has even gone so far as to target this demographic in advertisements, showing how the Echo Dot can help grandchildren keep in touch with their grandparents. Smart speakers have real functionality for this demographic. At the older end of the age scale, users could use voice technology to make emergency calls and to help those with limited mobility, in their daily tasks. But there’s still a way to go. 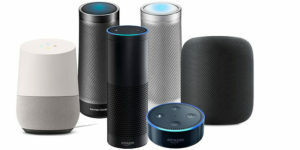 Using Smart Speakers comes naturally to people who are used to conducting searches on computers and other devices but not so much for others. It is not a completely intuitive experience for the digitally excluded. As the video below illustrates, older people may not understand the limitations of voice activation leading to confusion and potential harm. There is also the question of set-up once the unit arrives in the home. As with any product aiming to appeal to an older consumer, brands need to look at each of the touch-points along the customer journey to ensure that none of them pose an obstacle to purchase and trouble-free use.